It's a big air bag that can do big things. And you just need one. 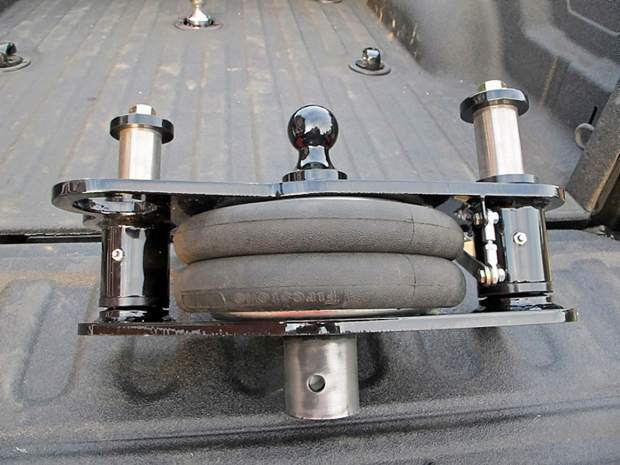 Installing it on your truck improves the ride of all the trailers you use. The C7 lifts out of the ball socket you have, just disconnect the quick coupler air hose and your truck bed is clear again to haul round bales. The C7 Air Ride Hitch has a Popup round stem with B&W square stem available and Atwood bolt on with more models coming. It takes up less space than a 5th wheel and is easier to take out. The leveling valve that controls the air pressure in the bag according to the weight of your trailer, is the same one used in semi trucks and trailer air suspensions. This makes the C7 automatically the right air pressure for any trailer you hook to. Your investment in a Living Quarters horse trailer may have glued in mirrors and stapled in woodwork. I've seen the pieces falling off the walls of my LQ trailer that was custom built from a couple years of bouncing down the road. Just starting and stopping with a trailer can be jerky. C7 Air Ride Hitch removes much of the movement from the trailer, which you can feel in your truck. Doing this review, I drove on severe roads, taped bottles of pop on the trailer and watched the volcano action from the soda without the C7 Air Ride Hitch. I sat in my trailer with another driver at the wheel and to me it felt like at least a 50 percent improvement in ride and vibration. C7 isolates truck bounce from trailer bounce. All that bouncing down the road wears on your truck and trailer and you. My trailer has an oblong thru pin hole up and down from all the miles of impacting the road through the truck. Just like hitting the trailer coupler with a hammer all day. 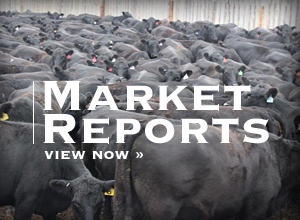 Trailers are growing, weights are higher and the roads don't seem to improve much. 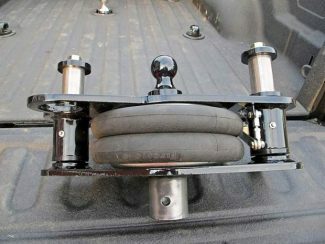 C7 Air Ride Hitch goes up and down so you won't see the rocking action that can wear the ball out on other air hitches. Cattle are a good test for an air hitch. Horses will settle down and rock a little, but cattle dance the whole trip and you fill it in the cab. It is easier to reach the safety chains on the back of the C7, shortbed and longbed trucks are the same length from the bumper to the ball, this means the safety chain holes are closer to the rear of your truck. 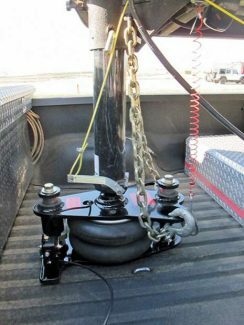 With the leveling valve like a semi truck, C7 Air Ride Hitch works with trucks that have air suspensions like M2 Freightliner, Peterbilt 335 and International. Some cushion goosenecks bounce more with truck air rides. C7 makes a dramatic difference with trailer ride on all trucks. If you're towing your horse trailer with a converted semi tractor, you need the C7 to smooth out an over-the-road heavy duty suspension. C7 will take some of the jerk out shifting gears on the big rigs. 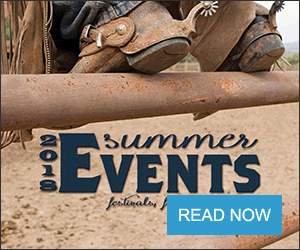 Get a year or two more out of your favorite horse, making money at jackpots, rodeo's and endurance events. Cut the stress on your horse, truck, trailer and you. It's not easy to find a good horse and a C7 is a whole lot cheaper. Kent Sundling (alias "Mr. Truck") spent 20 years wearing out pickup trucks as only a farmer could. With over one million miles pulling trailers, Mr. Truck has a unique collection of truck and farm stories that will educate and entertain. Mr.Truck gave up his bib overalls and John Deeres in his quest to save the farm and moved to the big city to sell trucks. After selling trucks for 10 years, this farmer now writes for eight magazines and owns over two dozen websites, helping folks find the "Right Truck." If you have a question for Mr. Truck, you may contact him at his website, http://www.MrTruck.net.